Most golfers fear hitting a shank. 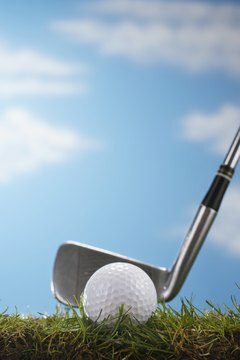 If you ask a golfer what's worse, hooking a shot into a water hazard or hitting a shank -- a shot that flies off the club at a strange angle, such as nearly straight to the right -- he might very well choose the hook over the shank, even though he loses his ball and incurs a penalty. Hitting a shank is embarrassing and a golfer who hits one shank has a lingering fear that he's going to hit another one, or more, during the round. Practice with a barrier. A shank occurs because you strike the ball with the neck or hosel of the club rather than on the clubface. Instructor Dave Pelz, writing in Golf.com, has devised a simple practice drill to address a shanking problem, which he calls "The Shanker's Delight." Place a cardboard box, a pillow or other soft material on the ground in front of you, 1/2 inch beyond the toe of the golf club when you address the ball. Take short swings at first, gradually increasing the length as you learn to make solid contact with the ball and not bump the club into the barrier. Then take away the Shanker's Delight and hit more practice shots, keeping a mental image of the barrier still being there. You can execute this same drill by placing a row of five tees in front of the toe of the club, and focusing on hitting the ball and not the tees. Strengthen your grip. Instructor Jeff Yurkiewicz, writing in "Golf Tips" magazine, points out that a weak grip -- in which the left hand is turned toward the left so only one knuckle is visible when you look down at your hands at address (for a right-handed golfer) -- can increase the chances of shanking. The recommended cure is to turn the left hand more toward the right, which makes it easier to release the hands through impact so the clubface won't be wide open when you strike the ball, but rather in the desired square position. Change your swing path. Yurkiewicz also suggests learning to swing more from the inside out. He recommends starting the takeaway inside your target line and letting the body initiate the downswing to prevent "coming over the top" with the club. You want to feel as though you're dropping the club into a slot on the downswing. The instruction book "Private Lessons" suggests a drill -- with an iron, not a wood -- to learn how to bring the club more toward your body as you approach impact. Line up two practice balls, one 4 inches beyond the other. Address the ball that's farther away, then hit the nearer ball. You should strike the ball squarely on the clubface rather than back on the hosel.